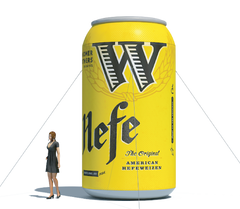 Promote your company's beverage with a massive can replica! 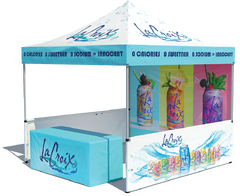 We will take your branding and logos and place it on an inflatable can replica to make it look just like it, except much bigger of course. 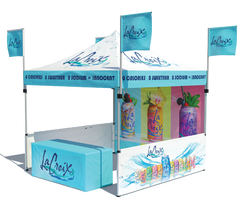 The 10' advertising can will be the center of attention for your event and it will provide great photo ops for your team and those visiting your event. Our in-house designers are very experienced when it comes to replicating cans and turning them into giant inflatables. They will create a free 3D mockup for you to see it to scale and if any changes come up they will work with you on revisions. Our production team will then manufacture the heavy duty inflatable with our premium materials to ensure a durable product. We also have fast turnaround times and will ship it to your door after only 10 business days! Your inflatable will also come with all of the necessary items for you to install it. This includes the blower/inflation system, rope (to secure the inflatable), (1) ground tarp for the inflatable and of course, the custom inflatable replica. US made, high quality, extremely durable inflatable. Deal directly with trusted US manufacturer with over 30 years of experience. All of our inflatables are constructed from a heavy duty 7oz. vinyl coated nylon. 3-year Manufacturer’s Limited Warranty: Covers workmanship and materials. Since we manufacture every inflatable from heavy duty materials and inks, we guarantee the material will not fade or crack. Inflatable material is CSFM and NFPA certified fire retardant which is compliant throughout all 50 states. We can digitally print any image, logo, or text directly on the inflatable. 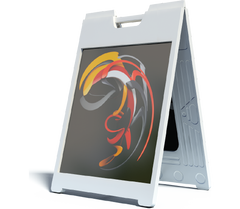 With our high resolution graphics we can ensure crispy detail on every print. Includes blower system. Most 15’ models (and smaller models) use internal blower systems that are UL approved. Includes carry bag and heavy duty ground tarp. Optional Add-on: Internal LED lighting available upon request. Free 3D rendering for all products ordered. Upon receiving your graphics we will add them to our inflatable patterns and create a mockup for you to see what it will look like. During the layout and mockup process you can let us know about specific colors and we will print them as close as possible to the requested hue. Item Summary: Price includes custom printed inflatable, blower system, carry bag, and ground tarp. Final price will depend on complexity, size, and quantity ordered.